Want to Know What a New Car is Worth? 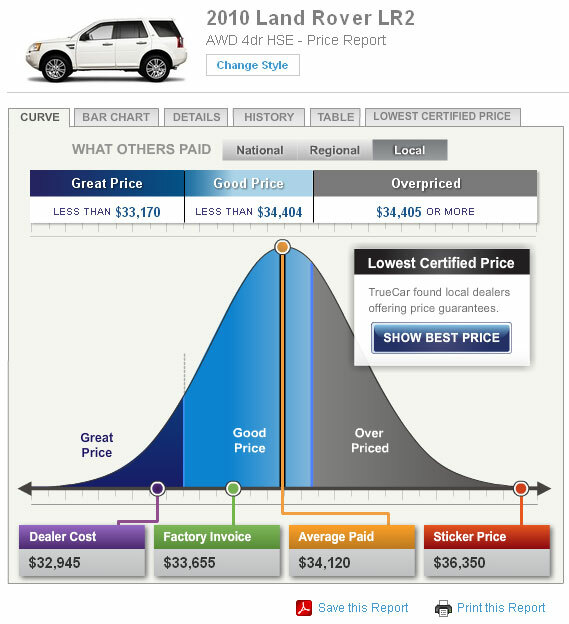 When you’re looking to purchase a car it can be sometimes difficult to figure out what price to settle for. In fact, if it’s your first time buying a new car it can be really daunting to know what to offer the new car dealer. If you offer the wrong amount, you can not get taken seriously, or even worse totally ripped off. In trying to find you the best car buying tips possible, we went out to try and find some information on other car buyers and what they’ve paid for their new rides. This little site will tell you what others have paid for the new car that you are looking into buying. As you can see in the screenshot below, truecar.com will let you know the average price paid for the car compared to the dealer’s cost and the MSRP price of the new vehicle (sticker price). This information will give you the edge over the new car dealer when you start your sale negotiations. Get an insurance quote for the car you’re thinking of buying. Apply for a car loan online, get instant approval, and often a better rate than your bank or your car dealership. Have any of you ever used this service? Have any other ideas? Let us know in the comments section below this post. This entry was posted in Car Buying Tips, Editorial and tagged buying a car, Car Buying Tips, car dealer, car financing, dealer financing, new car by CarTips.com. Bookmark the permalink.